Tradeshow booth displays can be as elaborate as your imagination and budget allow. Research shows that exhibitors have only three seconds to attract potential customers as attendees peruse the trade show floor. So, whether you have a small tabletop display or a large custom exhibit, consider using some proven trade show booth strategies to stand out from your competitors. For example, featuring bold graphics and booth extras including bold banners, mobiles, and special lighting can enhance the impact of your exhibition stand and, in turn, your sales results. Literature racks are a smart booth accessory because they allow you to create visibility for your handouts and engage with booth visitors when they are taking your materials for post-event review. Banner stands give people easy access to your posters and messages. Graphics murals allow you to display a number of posters in a spread with high-impact graphics that catching the eye of show attendees and attract people to your booth. Lighting options that include attractive light fixtures, product spotlights and light box panels make your booth more attractive and help focus your message. An attractive booth table, counter or island can provide function, as well as an appealing element to your exhibiting area. If you have a tabletop display, use a trade show tablecloth imprinted with your company logo for added punch. Tradeshow flooring can add a quality touch to your booth area and provides your staff with extra cushioning under their feet. Large monitors featuring video and product information help draw people into your exhibit area and help educate them on your product offering. Live product demonstrations in tradeshow booth displays always have high appeal among event attendees and help promote sales effectiveness. In addition to exhibit booth features, give careful consideration to your trade show promotional strategy. 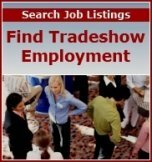 For information click here for trade show marketing techniques before, during, and after the show.